This was the main message of the DHI Academy, Hellenic Masters Meeting, 2017. The meeting took place on Tuesday, 12 December, at the National Hellenic Research Foundation, in the presence of high-profile and distinguished professors from the University of Athens, Greece. 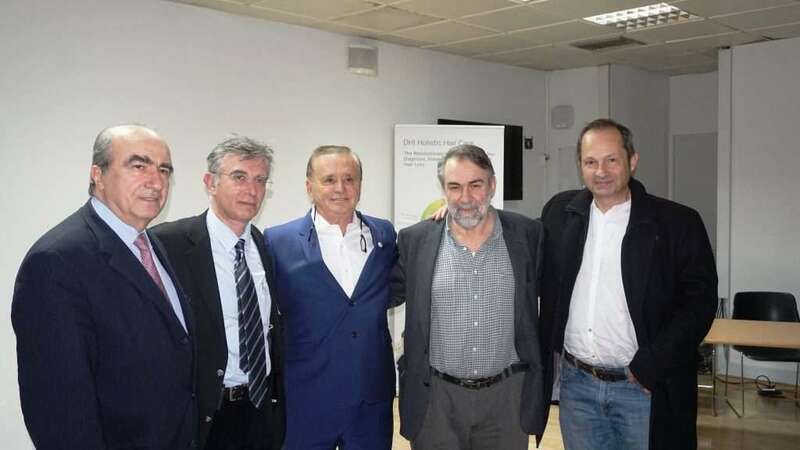 From left to right: Panagiotis Skandalakis, Professor of Anatomy, University of Athens, Vasilis Gorgouls, Professor of Histology and Embryology, University of Athens, Konstantinos Giotis, Founder of the DHI Global Medical Group, Haralampos Papageorgiou, Professor of Psychiatry, University of Athens, Georgios Dedousis, Professor of Biology, Harokopio University. During their speeches, the university professors, who are working closely with the DHI Medical Group in Athens, discussed many topics such as hair loss, research, diagnosis, prognosis, prevention and treatment. These findings were presented to usher in the new era in the fields of hair loss diagnosis and treatment through innovative diagnostic and prognostic procedures, which will contribute to even more effective treatments going forward. The conference was kick started by the founder of the DHI Global Medical Group, Konstantinos Giotis, who presented the new Holistic Medical Hair Care Program of DHI, which focuses on both the holistic and scientific methods of approaching hair loss treatment but also on the multifaceted examination of typical factors, which may cause hair loss, such as psychology, diet or gene predisposition. Plastic surgeon, Georgia Ligda Md, PhD, referenced the latest developments in Direct Hair Implantation as well DHI Academy collaborations with public universities, for the formal training of physicians of this technique, for the first time in the industry. Professor and Director of the first psychiatric clinic of the University of Athens, Charalambos Papageorgiou referenced the vital role our hair plays in our self-image and self-esteem, social perception and psychological function. He highlighted the significance of the DHI Hair Psychology test, the effective treatment of hair loss and the beneficial effects that DHI treatments can bring to a patient’s psychology. Professor of Histology and Embryology of the University of Athens, Vasilis Gorgoulis, together with his team referenced the DHI Hair Biology Test, which aids in the determination of DNA damage caused to hair follicles. The Professor spoke about the facts, mentioning that the accumulation of DNA damage to the stem cells leads to their aging. So in short, it appears that the hair is strongly involved and influenced by the aging process. In addition, he presented the new patented test ‘SenTraGor,’ for the detection of ageing cells in human tissue. Niki Chondrogianni, second researcher at the Institute of Biology, Pharmaceutical Chemistry and Biotechnology, spoke about the correlation between the carbonylated proteins and ageing and presented the new and very promising DHI Protein Test, which targets the detection and recording of the carbonylated protein levels of patient in order to more effectively treat their hair loss. Biology Professor at the Harokopio University, Georgios Dedousis, together with his team, referenced the vital role that our diet plays in hair welfare, He also discussed the innovative personalized nutrition plan initiated by DHI for its patients as part of the Holistic Medical Hair Care Program. The conference marks a milestone for the 47-year course of the DHI Global Medical Group, as the company introduce a new era in prevention and treatment of hair loss, highlighting the significant role hair has in anti-aging. The holistic and scientific approach of hair treatment by DHI, and the multifaceted examination of factors which could contribute to hair loss (such as psychology, diet or genetic predisposition), is a unique innovation for the effective treatment of hair loss, but also for the improvement of the patient’s health and wellbeing in general.